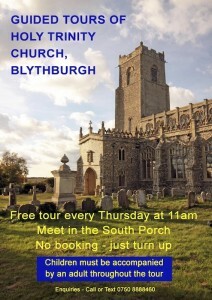 Tours of Holy Trinity, Blythburgh. Holy Trinity Church is undoubtedly the most impressive building in Blythburgh, and the one that comes to mind when people think of the village. A free general interest tour of the church is given by Blythburgh resident Colin Huggins, taking place every Thursday at 11am, and lasting up to an hour. Booking is not necessary– just turn up. Children need to be accompanied by an adult. If you plan to visit the IBBAS exhibition on Thursday 22 August then why not include the tour? Alternatively, Colin will also offer a tour on Friday 23rd August, starting at 5pm. This may set a fascinating context for anyone coming to Richard Hawking’s talk that evening at 6.30pm.